Between my fruity-versus-musky body washes and sulfate-free shampoos, my master bathroom looked like an episode of Hoarders. I had countless bottles and jars of this new miracle cream and that other cream, whatever it was called. Who knows? I just snatched it up because it was on sale. Quite frankly, I became so swamped with feminine products. I found myself reaching for the same ole scents over and over again. What else was I going to do, dig through the dreaded pile? I’m sure we’ve all been there. Please tell me I’m not alone in this. I tried my hand at sorting out everything and stacking it in a triple-shelf hallway closet. It worked, but only for a few days. Before I knew it, the bathroom sink area was all junky again. As the woman of the house, I thought I was the embodiment of all things domestic, all things wise and resourceful, but I guess the solution never dawned on me. My husband came home with a corner shower caddy, and the rest was history. I went out and purchased a couple more a week later and stored as many of my products as possible in each of the caddies’ compartments. The remainder, I either gave away or tossed to the back of the hallway closet. My bathroom mirror was no longer too cluttered to take a post-worthy selfie in it, and the hubby was happy our surroundings were tidy. That’s my story. What’s yours? Maybe it’s not as extreme as mine. Perhaps you’re simply in the market for the best corner shower caddy that money can buy. I have enough hands-on experience for us both, so here, let me share some suggestions. 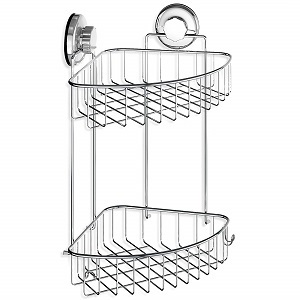 There’s nothing super fancy or especially attractive about the Constant Tension Corner Shower Caddy by Allzone, but I like the way the stainless steel pole cascades down the middle of the trays. It gives it some character, a hint of edginess, a little je ne sais quoi. The thing about the pole is, you must have it positioned properly or else it’ll wobble all over the place, unable to withstand the weight of your belongings. Technically, there are four poles included. You’ll love the versatility, being able to lengthen or shorten your caddy accordingly. It’s nice to have options. White has a way of getting dirty in a heartbeat, so clean your trays often with a wet cloth and that should keep them from appearing dingy and thrift-shop-looking; although, for the record, there’s nothing at all in the world wrong with a trendy consignment store. But let’s continue. 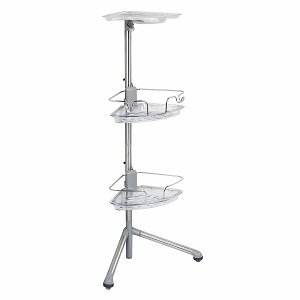 The pole allows the trays, or shelves, to be adjusted according to bottle size or height. That’s my favorite feature. This also comes with automatic draining and protective barriers to keep the trays from toppling over, spilling your goods. Allzone took it easy on us with the price tag. I know a deal when I smell one. Are you sniffing what I’m sniffing? This comes with one reinforced aluminum pole, but it extends up to 9 feet. It nestles between your ceiling and floor nicely thanks to a high-compression spring with rubber grips. The modifiable shelves slide up and down for your convenience. Towel hangers clamp and attach onto the pole for your convenience. This is where I put my washcloths and loofah scrubbers-on-a-rope. These hangers come in handy every single time. Storage hooks are able to contain your toothbrushes, razors and a myriad of other accoutrements. If water splashes on the pole, you won’t have to go into panic mode. The aluminum coating is rust proof, so it takes care of that. As much as I cherish this caddy in its entirety, I can’t get enough of the holes. Yes, I said the holes! There are these wide, distinctive holes that will enable you to place your bottles upside down, and from there, you can squeeze them, dishing out their contents like it’s nobody’s business. Too fun, too brilliant. I’m a fan. The cost is a bit up there, but it is worth every penny with the extras included and all. Installation isn’t difficult whatsoever. Once you take the initial steps, the tension pole does the heavy lifting, so to speak. Best of all, you don’t even have to bring out your toolset. Simplehuman really has done the work for you. Furthermore, they extend you a 5-year warranty. Five years? That’s probably worth taking. 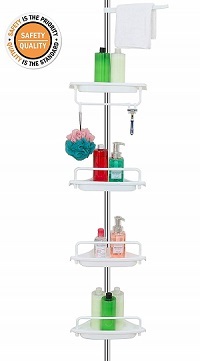 Now that we’ve dealt with the “tension,” it’s on to the standing shower caddy. Oxo, by the way, I adore their name—went all utilitarian on us with this. And that’s all right because I enjoy practicality when it comes to everyday, mundane activities like bathing. It kind of makes sense. It stands about 3 feet. I prefer more storage room than that. I have a lot of grandiloquent stuff. Nonetheless, stainless steel trays themselves are sturdy and roomy. Surprisingly, I can store the majority of my toiletries without any hiccups. There’s a no-tool assembly process, which will always get my stamp of approval. If you have a smaller shower or fewer hygienic items to stash than most, chances are a caddy this size is all you need. Tiny or not, I couldn’t get it to fit in my tub when I was doing a little experiment of sorts, though it might fit in yours. I don’t believe Oxo advertised it as such, so it’s totally not their fault. I’m just a curious soul, but I digress. The plastic parts don’t do much for me. They are too delicate at times, and I’m accidentally too rough. That’s a bad combination. I’ll give it this much; the non-slip feet afford it stability, and because it’s not all big and tall, it doesn’t get in the way. It goes over in the corner and humbly earns its keep. Maybe one day my kids will follow suit. Not! Apparently, we’re back to the tension again. Yep. I’m going to highlight Zenna Home’s Tension Corner Pole Caddy in the model 2130NN for a couple of moments. I’m trying to think about how I can explain my sentiments on this purchase. Well, the price was certainly within my means. But I have a question. Have you ever wanted to like something, but for one reason or another it made it impossible for you to embrace it, after all? Gee, I hope you’re good at reading between the lines because I am totally beating around the bush here. I’m one to present the advantage of the doubt, so therefore, I’ll shoulder the blame. I had a fancy-schmancy showerhead, and it gave all-too excellent coverage. Even though Zenna Home said it was rust-resistant, my caddy didn’t get the memo. I won’t use this as a strike against the manufacturers, not this time. My caddy must’ve rusted out because of all the excess water splattering on it from my dynamic showerhead. That makes sense, right? Prior to its departure, I took full advantage of its seamless installation and generous height. The baskets were lovely. The design was well-thought-out and easy on the eye. I was thrilled to see that this model came in different colors. I went for the satin nickel version. It came with four tension poles. It came with adjustable baskets, four of them self-draining and one larger, deeper basket for handling heavier items. I prized it while it lasted. 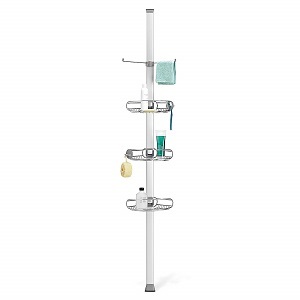 Hasko had a 2-tier design in mind when they created the Suction Cup Corner Shower Caddy. They executed their idea very well. The first tier of the basket is designated for your shampoos, conditioners and other hair products. The bottom tier is for your body washes, scrubs, soaps, and other hygienic products. You don’t have to follow those guidelines strictly, of course. You don’t have to follow them at all, actually. Just put your odds and ends in whichever basket works for you. That’s what I do. Sometimes, my conditioners and soaps end up side-by-side, and they don’t weigh the caddy down any more or less than when I reverse their placements. Despite its first impression, this caddy is truly hard-wearing. And so far, Hasko has lived up to their rust-free guarantee. I’m grateful for that. The giant suction cups have supernatural-like strength, upkeeping everything in its rightful place. Kindred to the other caddy selections on the list, this model requires very little assembly. Also, it’s corrosion resistant due to the materials used during construction. It’s conservative. It won’t break the bank, and it’s not clunky. Sad to say, in a few weeks, after some upcoming upgrades to my bathroom are completed, I won’t be able to use this caddy anymore. Be sure to take this limiting condition into consideration before purchasing this item, just my advice. 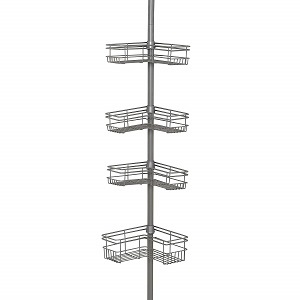 Since shopping for caddies, what I’ve discovered is this: They share a lot of identical key features and traits, from shelf design to pole structure, from adjustable baskets to grips and rubber feet. There is absolutely nothing wrong with this. There’s nothing new under the sun. I guess I just have a different vantage point about them than I did the day my husband brought the first one home years ago. Most of the time, whether you’re buying a caddy or a pair of flip-flops, you get what you pay for, so you should keep that in mind, always doing your research before making your final selections. Granted, Simplehuman carries the most expensive model on the list and nobody wants to fork over more moolah if they can get a cheaper option, but it’s still the better option, the best option, to me. What sold me was the towel hanger clamps for my wet and dry washcloths. When all is said and done, the choice for best shower corner shelf or caddy is yours. I’m just glad none of our bathrooms has to look like we’re auditioning for. Hoarders ever again, and maybe that’s all that matters.